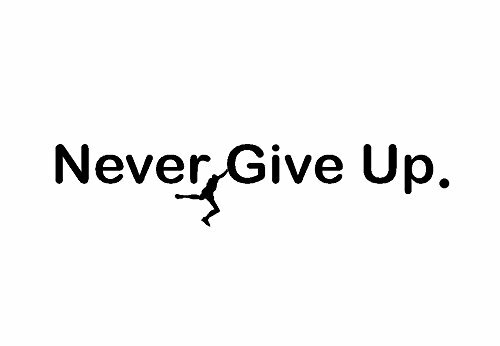 (( Proudly Made In The USA )) 2015 StickerCiti // Ships and sold ONLY by StickerCiti //NEVER GIVE UP Decal Is a US Copyrighed design by StickerCiti Made of 7 Years Premium quality Outdoor Vinyl Material, waterproof, self-adhesive, and removable. Decal will not fade or run when wet. Decals can be EASY applied to any clean, smooth, flat surface. Decal has clear application tape over the top for easy application, Clear application tape is removed once Decal is applied. Die Cut - Not a cheap paper Sticker with NO BACKGROUND /// Decal will come as 3 parts - the backing paper, the sticker itself, and the clear transfer tape. If you have any questions about this product by BERRYZILLA, contact us by completing and submitting the form below. If you are looking for a specif part number, please include it with your message.